Get ready Campers its time again for The Castles annual camping trip! Four days and three nights of games, laughs and adventure at Camp Chautauqua in Miamisburg Ohio. The Castle itself will be CLOSED for the week. Beth Ann G. unexpectedly went to be with the Lord on February 1st, 2018. She was a vivacious and fun-loving woman who absolutely adored animals and …making people laugh. She loved to read and one of her wishes was to visit Paris, France, which she was able to do with her sister last year. Beth gave her life to Jesus and we are sure she is bringing sunshine and joy to all of heaven. She is survived by her only child, Autumn G.
A Memorial Service in memory of Beth will be held on Tuesday, February 6, 2018 at 5:30 p.m., at City Church, 138 S. Wilkinson St, Dayton, with Pastor Micah Hill officiating. The staff of The Castle will be attending and will provide limited transportation to the service for members wishing to attend. The Castle is going to camp. This year we are trying something different. We are heading to Camp Chautauqua in Miamisburg the third week of August. We are very excited about the opportunity to attend this amazing camp. If you would like to sponsor a camper the cost per camper is $150.00. Please contact us at 937-433-3931 or 133 North Main Street, Centerville, OH 45459. America, our nation and it’s leaders, and our U.S. military Forces. Greetings from San Antonio, Tx. I attended the National Alliance on Mental Illness Conference from June 27 to June 30. There were literally dozens of workshops offered to the over 2000 attendees on everything from schizophrenia to bi-polar disorder to manic depression to eating disorders such as bulimia and anorexia nervosa. There were workshops held concerning the growing population of Hispanics in the US, the high rate of depression and unemployment among college students and seminars on Alzheimer’s disease and other disorders. A gallery of photographs done by people with mental illnesses was presented. I made it a point to network with as many people from across the United States as I could. I met many people, professionals and consumers from all walks of life who have direct experience with mental illness and I listened intently to the devastating stories they had to tell. It was an overwhelming experience and I hope to attend and possibly present a consumer workshop next year in Washington DC. Thanks so much to all folks who allowed me to attend. It was an experience I will never forget. Remember as the theme of the conference said: Together we can make a difference. Believe me we really can one day at a time one student a day. 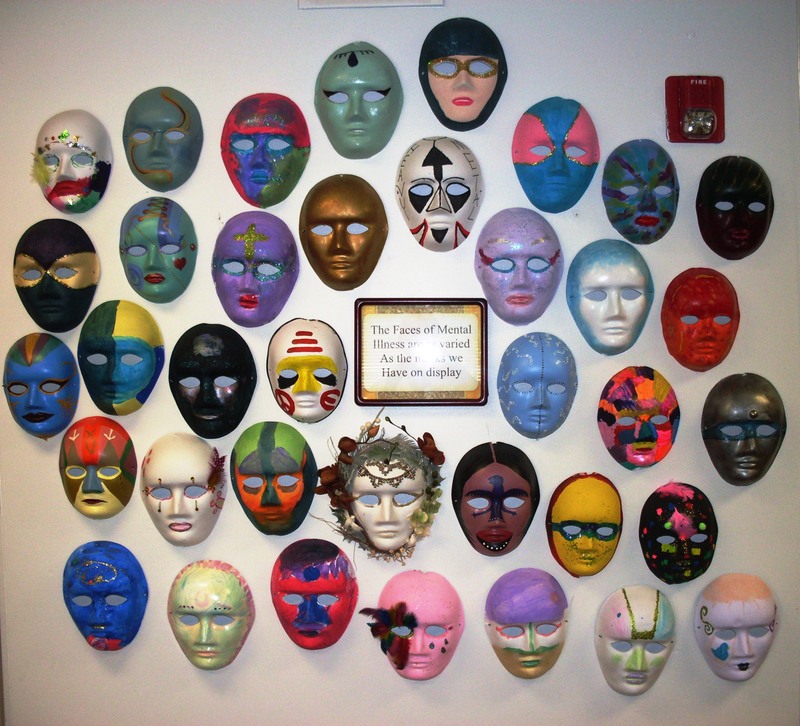 The Castle will be displaying masks created during last fall’s Mental Illness Awareness Event at the Centerville Art Gallery within the Police Department (155 W. Spring Valley Road in Centerville). The gallery show is open to the public any time (day or night) through the month of August and is coordinated by the Centerville Arts Commission. This display was featured in the Summer 2013 edition of the Centerville Town Crier. Look for the television spot on Centerville Reports.